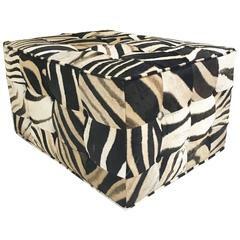 Decorative zebra hide ottoman. Zebra hide is from South Africa and the ottoman is made in NJ. 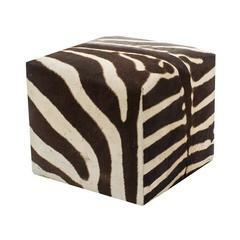 Decorative zebra hide cube ottoman. South Africa. Large zebra ottoman, 42 inches by 42 inches. Great as a coffee table or ottoman. Decorative zebra ottoman. We also custom size and shape. 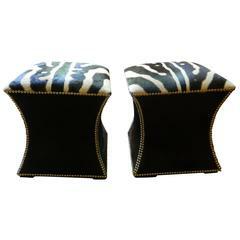 Decorative zebra hide backed with wool felt and trimmed around the edges with a leather trim. Fashioned from a complete hide sporting its mane. The ottoman is cocktail table height and is supported by a silver gilt wood trimmed base terminating in ball feet. 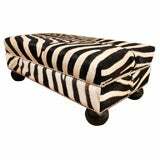 A very nice and decorative ottoman made from a real Burchell zebra skin. This ottoman is from a high quality. Zebras are wild animals so the skin can contain some small scratches.